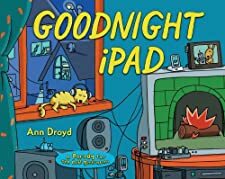 Ann Droyd’s latest product, Goodnight iPad, is a welcome push back against the tyranny of technology. Her subversive rhymes undercut modern society’s earnest addiction to digital devices. Droyd’s genius is made plain by the protagonist, the grandma. Stereotypically a figure of old fashion values and stability, Droyd’s grandma undermines contemporary stereotypes. Her radical rebellion against the status quo gives readers an opportunity to look beyond their narrow, provincial adoration of iPads, Androids and Kindles. Her final act of liberation frees her family from their electronic haze, pushing them toward a more authentic human experience. In a delightful post post-modern epilogue, Grandma’s keenest grandchild bursts through the boundaries of propriety, seeking her own sense of authenticity through an act of retrograde rebellion. Though not for the faint of heart, this product is recommended for all device users willing to confront the ethical perils of online ennui. This entry was posted in Uncategorized and tagged book review, parody, technology. Bookmark the permalink.